Ok, there’s probably not a lot of you out there that care about the “Analog Hole,” but I’m going to tell you why it’s important…at least to me ;-) Basically, it’s what people use to get around digital copy protection. Recording the audio output from a CD player is taking advantage of the Analog Hole. For video, recording from the component output was used. Unfortunately, HDMI has all but replaced the giant five-connector component audio/video cable as the HDTV connection of choice, but along with HDMI comes digital copy protection. Good news, I think. This device looks like the same thing as the Gang Hu HDMI Splitter and is finally available on Amazon! 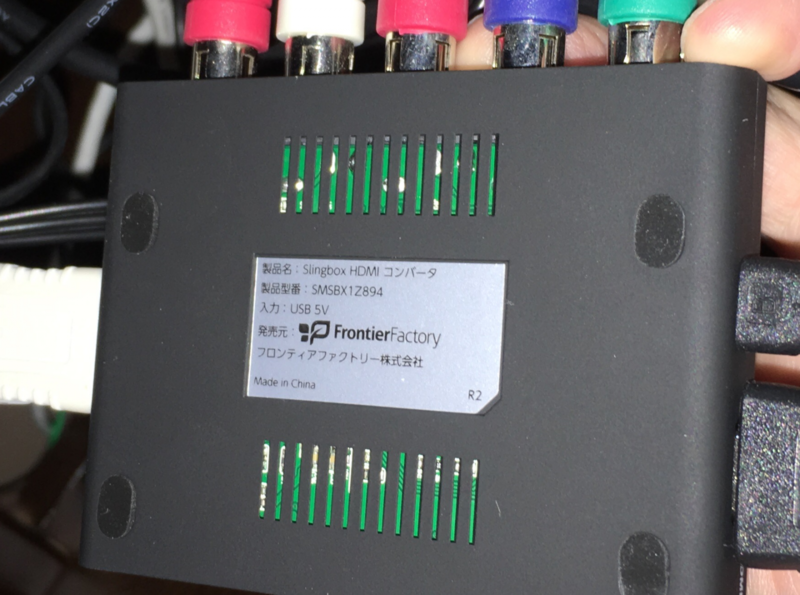 The seller is Frontier Factory whose name appears on the label of the Gang Hu device (see below). 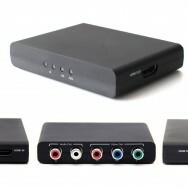 OLDER UPDATE: I found a similar device on Amazon called the Portta PETHRV HDMI to Component YPbPr + R/L Audio Converter. The nice thing about this device is it’s only $26 and free shipping with Amazon Prime. I bought one and here’s my short review. Fortunately, Slingbox has a solution to this problem on their website and it’s very interesting. They recommend getting an adapter that will convert HDMI signals to component video signals. The question that should immediately pop into your head is, “doesn’t this get around digital copy protection and wouldn’t that make such a device illegal?” Seems logical to me, but there on that page is a link to just such a device. It’s the HDMI Splitter from Gang Hu. Since the component-only Slingbox is destine for obsolescence, one would think that Slingbox would be all over this technology, build it into their devices or at least be a distributor, right? Well, all they do is describe the product and link to Gang Hu’s site so you can order the $59 device from them directly. Note that this is the only HDMI splitter I could find that converts the signal into component! It also is the only thing that Gang Hu sells and you cannot get it anywhere else. Moreover, the label on the bottom appears to say it is made by FrontierFactory. The name of the device is–get this–the “Slingbox HDMI Konbaata.” Konbaata is written in Japanese and I assume is bad English for Combater converter. (HAHA funny. I wonder if this device was designed for a specific purpose… ;-P) No UL listing and it’s made in China. What does all this tell you? It tells you that it’s probably dancing the line of legality and that’s probably pushing it. Slingbox is obviously trying keep a safe distance from the sale of the device by putting up a proverbial Chinese wall. So what did I do? I ordered two. HAHA. I just would not be surprised if someone sued this device out of existence and I wanted a backup. Installing the splitter is straight-forward. You connect the DirecTV box to the splitter and the splitter to your TV, via HDMI. Then you connect the Slingbox to the splitter using a component cable. The device requires USB-power, but as luck would have it, the DirecTV box sports a USB jack that worked fine. I believe the way it’s supposed to work is that the TV needs to on so that there is compliance with the so-called broadcast (i.e., copy protection) flag. What’s interesting is that I’m watching the DirecTV box now on my PC over WiFi and the TV is off! Now there are a couple possibilities as to why this is working: 1) the TV is essentially on even when it’s off; 2) there is no flag on the content I’m watching; 3) the Xbox One passthru is making the DirecTV box think the TV is always on; or 4) the splitter isn’t following the rules. Personally, I don’t really care. If it comes down to the TV having to be on, so be it. It would be worth it. The Slingbox video is crystal clear and you can’t tell any conversion is going on. The audio is a tad choppy, but I can live with it. Personally, I’m really happy that such a device exists and I can continue to use my Slingbox. Thank you Gang Hu! 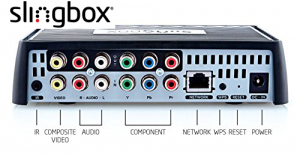 Just bought slingbox 500, cable box is a TIVO ( pace MG2) no component inputs but think I can connect via 3.5 mm port to component converter. I don’t want to degrade my 4k signal to the tv. Can I hook up HDMI out to tv and also 3.5 mm to component cable to sling box separately? I honestly do not know. Sorry Kemper. I do not know your specific SAT box but all Pace boxes I have ever worked with had completely separate HDMI and analogue outputs which could be operated in parallel. I suggest you just give it a try. I see a lot of folks mention losing their ability to view programming at 4K resolution when HDMI is daisy-chained through this Gang-hu/Frontier Factory box. In case it hasn’t been considered, it’s possible to purchase a “4K HDMI 1-to-2 splitter”. 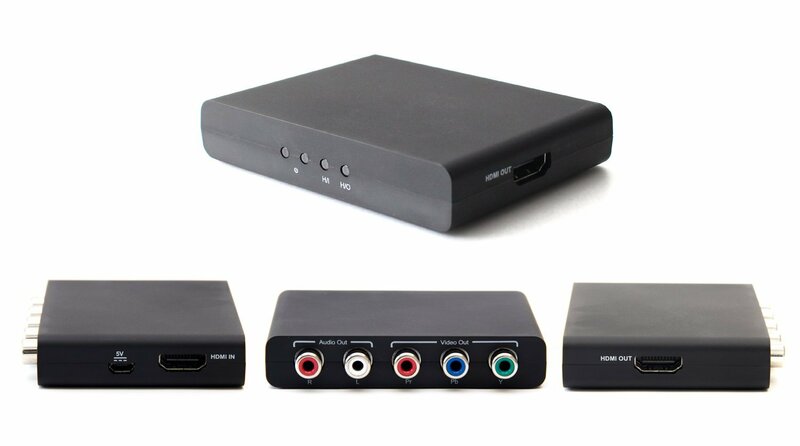 This takes the signal from the cable/DirecTV box & delivers two cable outs (powered by USB), providing the ability to connect “HDMI out #1” to your TV & “HDMI out #2” to the Gang-Hu HDMI-to-Component converter. $16.99. Thanks for the information about the HDMI splitter. I doubt, however, that this will allow you to stream 4k resolution video from any Slingbox through the Gang Hu splitter. The reason is that the 2 Gang Hu units which I use do both have a limitation requiring me to reduce the resolution of the input stream to the Gang Hu to 1080i/720p. Any higher resolution does not produce an output component stream. I have tested this by feeding the component output to a component input on one of my TV sets. Hans, I think what kurtsh is saying is that the splitter will let you continue to view *live* 4k content. 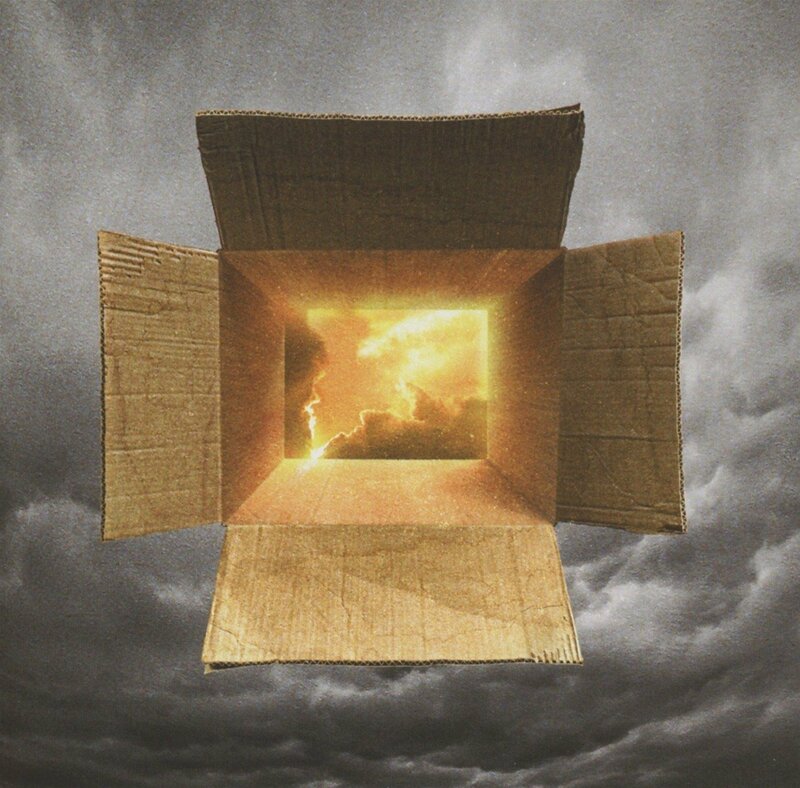 The Slingbox and GangHu will continue to be stuck in an HD world. I am in the same boat as everyone, I need to split the hdmi and have a component output, unfortunately this seller no longers sells this, is there any other solution? Ricardo, are you saying you can’t get the device from either Gang hu or the Amazon seller? They look available to me. Maybe you aren’t in the US. An alternative that some people use is a separate HDMI splitter box. See this article http://www.seriouslytrivial.com/2016/05/17/26-portta-pethrv-hdmi-to-component-converter/. There is a link to a splitter on the page. Did anyone else notice that the web site to purchase this Gang-Hu box isn’t secure? It isn’t https, so your credit card number is transmitted un-encrypted. Unfortunately I can’t find anything similar available eslewhere. May need to get a $70 temporary debit card for the purchase. Yes, I’m he sits is insecure. Used a card I don’t use often and then recycled it it with the cr cd company. The adapter arrived with no issues. Wade, FYI, I added a link under UPDATES to a new item on Amazon that looks like it is the same as the Gang hu. I bought the gang adapter from the U.S to use in the U.K., but it’s not worked not sure why, it’s all lit up followed conection map but no joy, I am right in thinking I only use the one set of component leads. Yes. The component cable should connect to Slingbox (or whatever streaming device you have). Does the HDMI passthrough work on your TV? Hi, how did you buy from the US as Gung-hu told me they did not ship to the uk? Thanks, Westie. Got the Gang-hu adapter, appears it only supports up to 1080i. Bummer. Confirm the 1080i limitation of the Gang-Hu but still the only device which allows me to stream TV from my Slingboxes in higher than standard resolution. Even more important in future: new generation Satellite boxes no longer have Scart or any other analogue outputs (e.g. Sky Q). This means you will only be able to continue using Slingboxes if you combine it with a Gang-Hu splitter. I can confirm that the Gang-Hu splitter/converter works well with my Slingboxes. I am now more concerned about the future direction of Sling as they appear to have closed down their European support and have ongoing problems with macOS Sierra and their Slingplayer software. Yup, I guess I’m just happy that it’s working now, but don’t have a lot of hope for its future. I just hope that the rights holders figure out what people really want and then we won’t even need a Slingbox. Has anyone tried with an 4K HDMI? I have a Roku Premier+ 4K (by the way Limeybastard, Slingbox can control Roku!!) and I want to convert the output to Slingbox Component Input. At this time I think that Gang Hu HDMI Converter is my first option. Portta PETHRV HDMI to Component YPbPr + R/L Audio Converter didn’t work for the slingbox. Waste of money and time! I’m going to try Gang-hu rather than HDFury2. Sorry to hear that Jak. My Portta works fine with my Slingbox M1. Maybe you got a bad unit. I’ve also got the Gang-hu and it works as well. Good info. BTW, “Konbaata” (or “kombaata”) is how “converter” is pronounced in Japanese. Would this device work to connect a HDMI compliant Roku to a Slingbox? My goal is to watch my Roku channels remotely without HDCP issues. I would think that it would work. I’m not sure if Slingbox can control a Roku however. Hi! I ordered one of these for myself, but the seller has not yet charged me. How long do they take to charge your card and how long does shipping cost? I sent them an email, but they have not replied to me yet. Yeah, they don’t seem to be the most responsive company, but the few times I contacted them they eventually replied. I can’t remember how long it took to receive the device, but it was slow…maybe a few weeks. Would this work to have the component out connected to a tv instead of the streaming device? Sure. Should work with any component input device. Yes it will. This is the way I tested out the Gang-Hu splitter and found out that it does not support resolutions beyond 1080i through the Slingbox. While I was getting a good picture on my TV from the component out the Slingbox did not produce a picture until I set the output resolution on the Scart to 1080i. Will the HDMI out on this adapter definitely pass 5.1 audio, or does it downgrade to 2 channel? I had issues trying a couple adapters together where the audio was downgraded. No idea. I don’t have surround sound system.